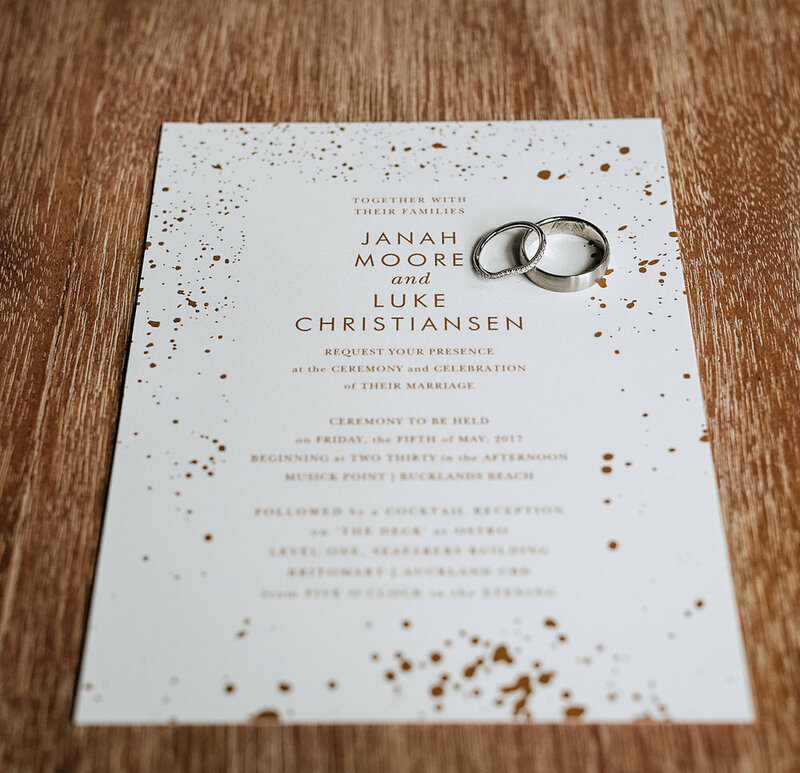 ‘We enjoy the simple things in life, and with this in mind we embarked on creating our wedding, with the intention of reflecting the things that capture the core of who we are as a couple. 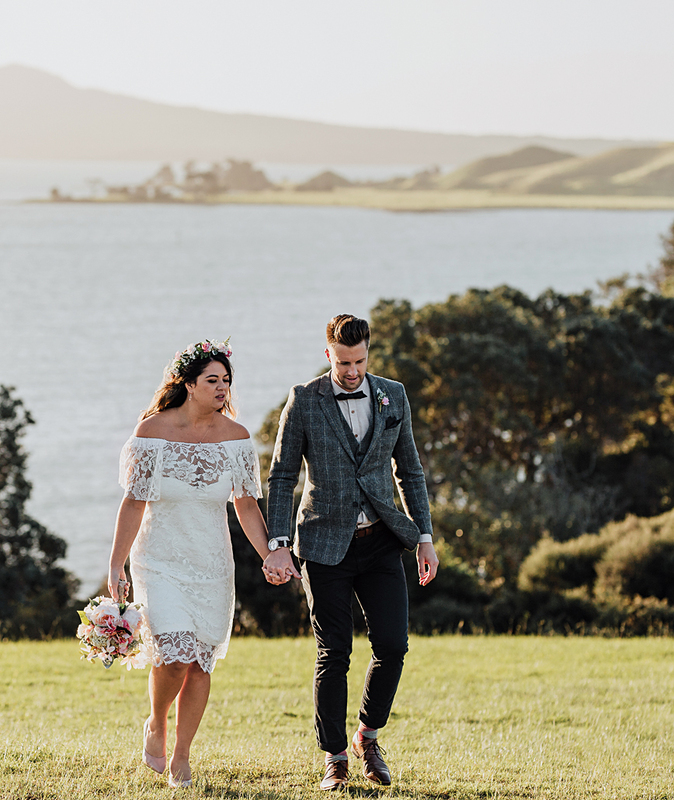 We secured the perfect spot for our ceremony, with a secluded circle of pohutukawa trees on the clifftop in one of the parks we had picnicked at early in our relationship. We discussed the look and feel of the ceremony at length and decided on a theme of vintage NZ autumn. 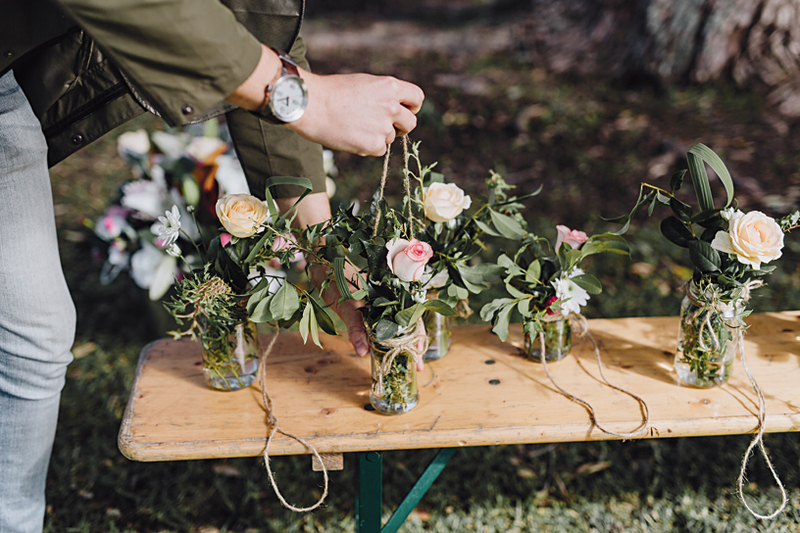 Sticking to the fun of DIY, the search for all the smaller details began, along with the manufacturing of flower jars, cake stands, various signs, an afternoon high tea set-up, the central arch beam, as well as the trailer and furniture hire etc. Anything we were unable to find, we made, and we spent many late nights perfecting the tedious task of signwriting and creating hanging flower jars to form the wedding arch. The wedding arch beam we made for the spot is particularly special, as we created it out of three different pieces of driftwood taken from locations that have a deep meaning to us. The first from the family bach, the second from our proposal spot, and the third from the bottom of the cliff below our ceremony location. 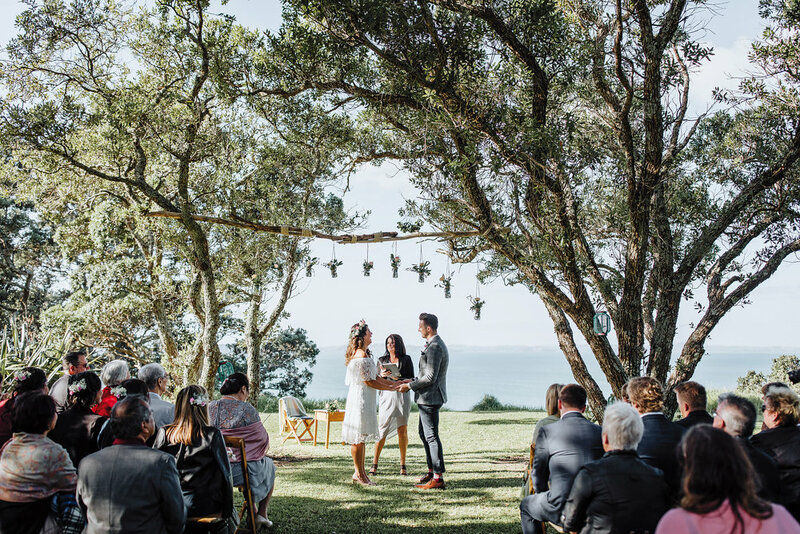 The beam symbolised our journey to date – from early beginnings at the family bach, the proposal on Waiheke and through to the point of marriage. On the day, I surprised Janah with the signing desk. I restored a vintage 1930s school desk and inscribed our milestone dates and other meaningful points in time in the desk lid. It wasn’t until she sat down to sign the marriage documents that she noticed the dates set in the lid of the desk. It was a special moment watching her reaction as she discovered all of our special dates. Post ceremony, we launched straight into the celebrations and cake-cutting to allow guests to enjoy a clifftop high tea picnic. 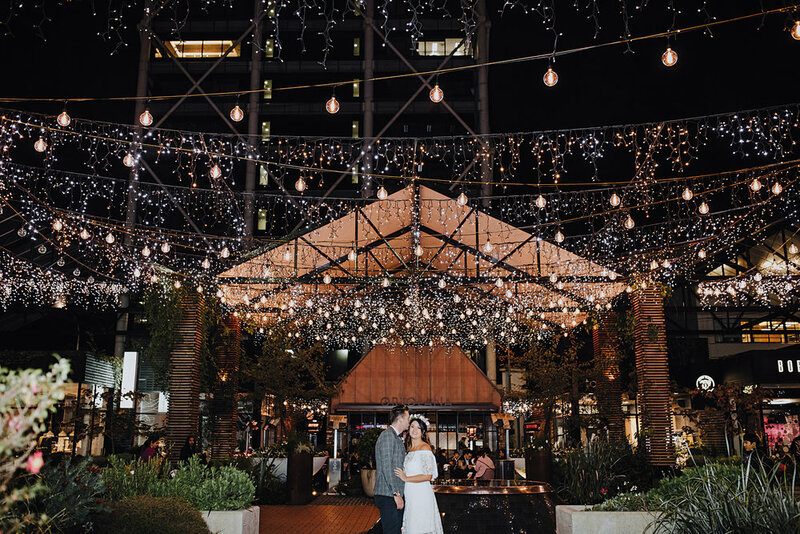 After indulging in both the afternoon views and refreshments on offer, guests then made their way to Ostro, where an informal reception was held. Our reception was a relaxed celebration and our own signature cocktails were served to guests on arrival – Mai Tai for her and Tom Collins for him. 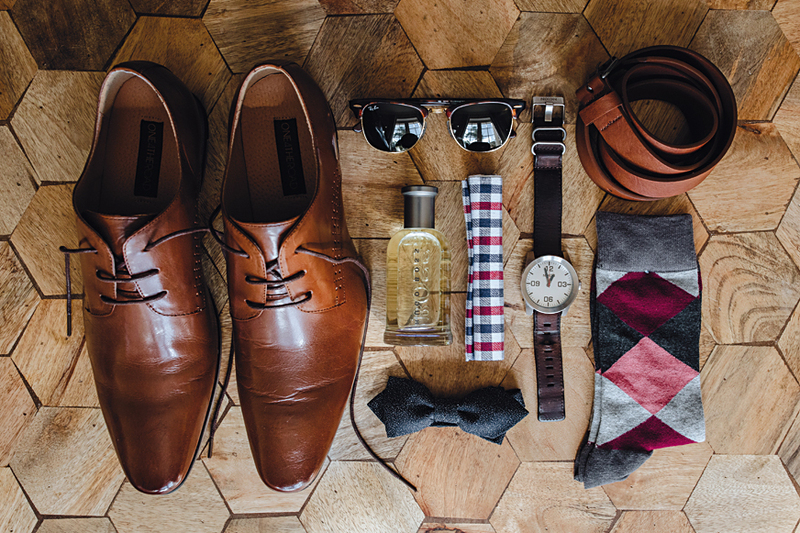 Luke has won a stylish suit package from Barkers, a gift card from Savar, a Remington Barber’s Best Personal Groomer, and his and hers fragrances from Elizabeth Arden and John Varatos.